If you like Monty like I like Monty, then you should check out this story in the Independent below. It’s full of good quotes, some humor and definitely some “oh really’s!”. When I first read this, I thought he must be delusional. How does he possibly think he’ll really contend in 4 majors over the next 5 years? Look at his record of majors to date. Even in his best years, Colin has struggled. And in the past 7 attempts at majors, he didn’t qualify for 1, missed 5 cuts and tied for 42 in the other. Sure he had a near miss in 2006 at Winged Foot, but that was two years ago. Monty was once mighty, but today, mostly Monty is just miffed. Now don’t get me wrong. I really do like Monty very much. I always enjoy watching him on TV and I find his grumpy, growly, grizzly demeanor very entertaining, if not “endearing”. He’s just kind of loveable – a curly haired teddy bear (a little over stuffed perhaps, but cuddly anyway). 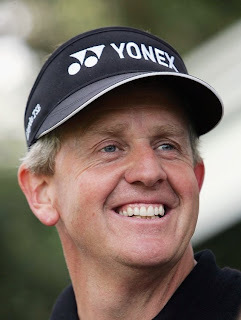 Some have called Monty the dark horse at this week’s US Open – an understatement if there ever was one. But I believe in miracles, so this weekend, I’m hoping for Monty to play as if an angel is sitting on his shoulder. Play well Monty! Let’s give Nick Faldo a reason to pick our favorite Scot for the 2008 Ryder Cup Team. It won’t be the same without you.